In the southwest of Ireland, all roads lead to Kenmare. It is a serene little town, snuggled up against mountains, sea and river, concise in its layout and boundless in its personality. The Irish name of Neidin, or little nest, is certainly apt, given not only how the town itself is nestled amongst some of Ireland’s tallest mountains, but also given the nurturing nature of the townspeople that run the shops, restaurants, and accommodation. Using Kenmare as your base for an exploration of the southwest of Ireland is an excellent choice, as you’ll find so many wildly different scenes less than an hour’s drive away. To the north of town is the road to Killarney. 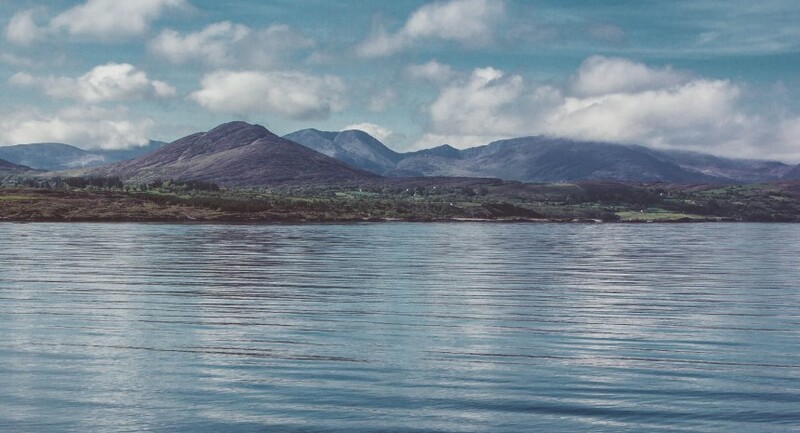 the steep drive brings you through Moll’s Gap, a pass in the McGillicuddy Reeks aka the Black Stacks, and through Killarney national Park, with its storied lakes. Heading out of town along the Sneem road puts you onto the Ring of Kerry. Here you’ll find the sprawling beauty of the Iveragh Peninsula, and lovely towns like Sneem, Caherdaniel, Ballinskelligs, and Valentia Island. Due south from Kenmare is the Sheen Valley, where you’ll find Bonane and the tunnels of the Caha Pass. Barley lake lies this way, on the road to Glengarriff, Co. Cork, and onwards to Bantry. The Ring of Beara, along the Beara Peninsula, begins as you head southwest from town. Along this road you’ll find some of the wildest and varied landscapes Ireland has to offer, and quiet villages full of beauty, like Tuosist, Lauragh, Allihies, Castletownbere & Dursey Island. Kenmare is most often approached from the east, so you might think you’ve already found all there is that direction. But take time to visit Kilgarvan village and the views as you enter Kerry for the first time.